I love a good concert. The lights, the music, the crowd, the anticipation! Waiting for that moment when the artist walks out on the stage and the audience goes wild, I…get…chills. (Kinda like the hyena in The Lion King when she hears Mufasa’s name.” I love it! And I love the smiles and laughs the artist gives when they are just so overwhelmed at us – the fans. Screaming, cheering and chanting their name. It is wonderful. If you ask my friends and family, you will find that I am always game for a good concert. And because I love concerts so much, a lot of thought goes into my “concert look.” I mean a girl has to consider a lot of things before heading out. You have to consider what the weather is going to be like. Is it indoors or out? If indoors, do you need a jacket? What about parking? Will you have to walk far? Do you need flat shoes or are you just going to sacrifice comfort for style? You need clothes that allow you to move. Most of the time, I am out of my seat and shaking my bon-bon. So when I started thinking about this Jill Scott concert, this outfit came to mind. i purchased it months ago and saved it just for this event and it was perfect. Not only was it comfortable but it is stylish, chic and on trend. I was a little hesitant to rock…wait a minute…a crop top but after it arrived in the mail and I tried it on, I was in love. Check it out below and tell me what you think. The Eric Michael Wedge bridge function with fashion and comfort with style. I started the day at 10:00 am with these shoes and lasted until after 11:00 pm. This look was so comfortable that I didn’t want to take them off. After a long day, they would also make the perfect lounge set! And I adore the extra long length on the pant. So if you are wondering if you can rock a crop top, just go for it. Adding a solid jacket like I did made the look a little less edgy. 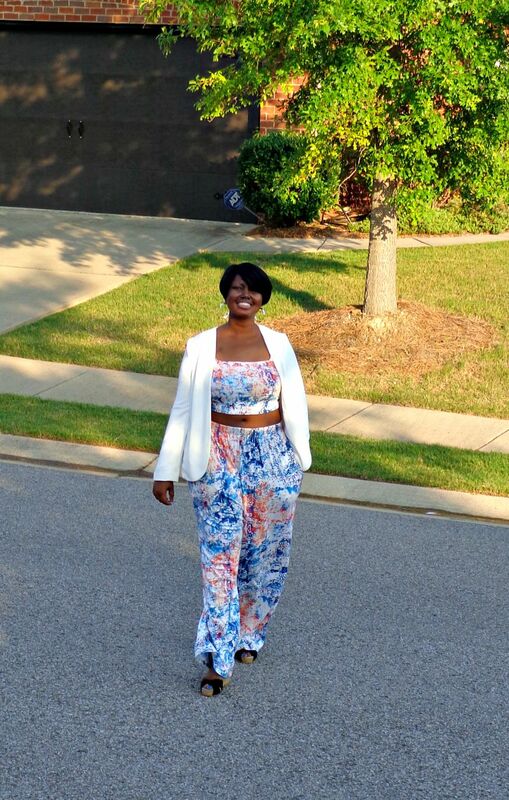 This wide leg pant is the perfect silhouette for your curves. 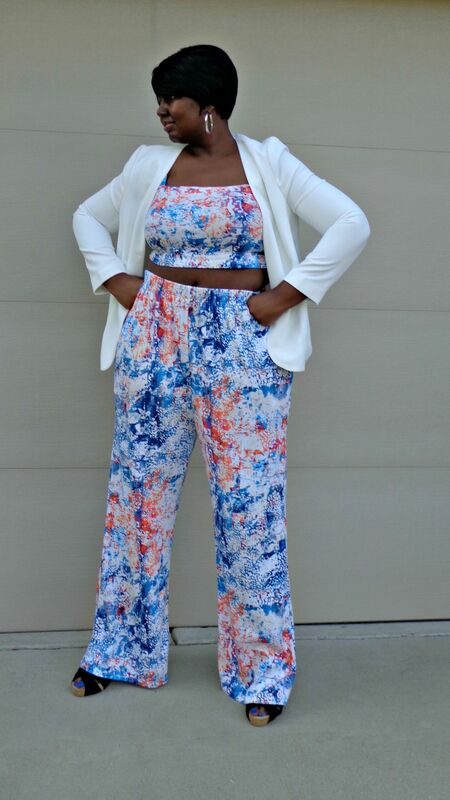 If you haven’t checked out Rebdolls you need to and if you plan to rock a crop top or have a killer matching set, snap a pic and show me. Wow this is a cute outfit. I love wide leg pants and I wouldn’t mind a crop top that shows just a little bit of skin. I fear ordering online due to sizing but I may just try this. Thanks. It is so comfy. I had to give online ordering a chance. I was concerned too but once I checked the sizing, it waseems okay. Thanks for checking it out. I’m loving EVERYTHING about this outfit! You are rocking it girl! Girl. Thanks. I will be ordering more from this site. Awww, now don’t you look FLY!!! I LOVE THIS colors, style, and all… Especially finishing it up with a jacket too. GOOD LOOK… I LOVE sewing, so seeing this look from the places where it’s available to buy makes me just want to sew it up myself LOL. This is a very cute little outfit. I love the color scheme and the pairing with the white jacket. I love a crop top and a flow pant. I hope you enjoyed the concert! Cute! I love the wide legged pants! Love that you finished it up with the jacket! Thanks. I think the jacket set it off. Love the print and how summer perfect this is! 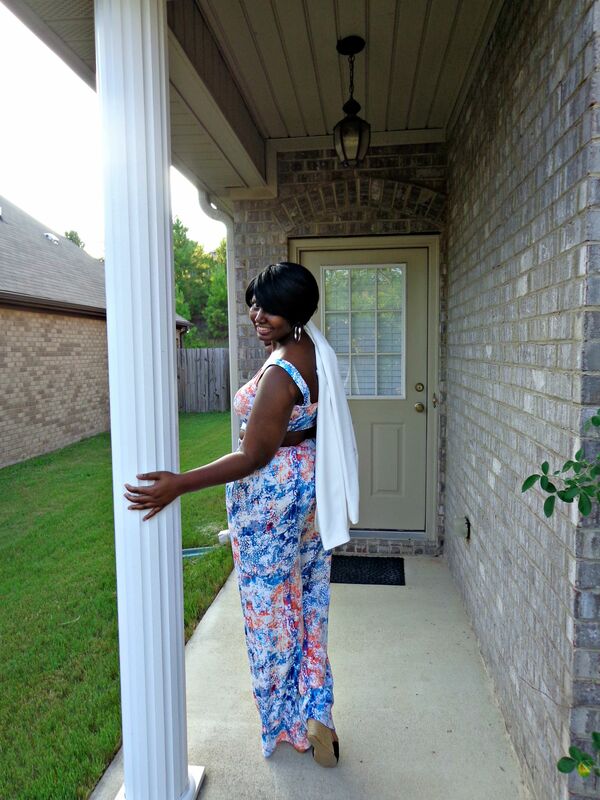 And I love rebdolls for affordable, trendy pieces. First I LOVE concerts too! I’ve seen some of my favorite artist like Beyonce + Jill Scott at least 2x. Anyhoo…. your outfit is SUPER cute and I love how you paired the blazer with your outfit. Thanks. Concerts are an obsession. And I love all genres so I’ve seen Maroon 5 twice, Beyonce, Bruno Mars and it goes on. 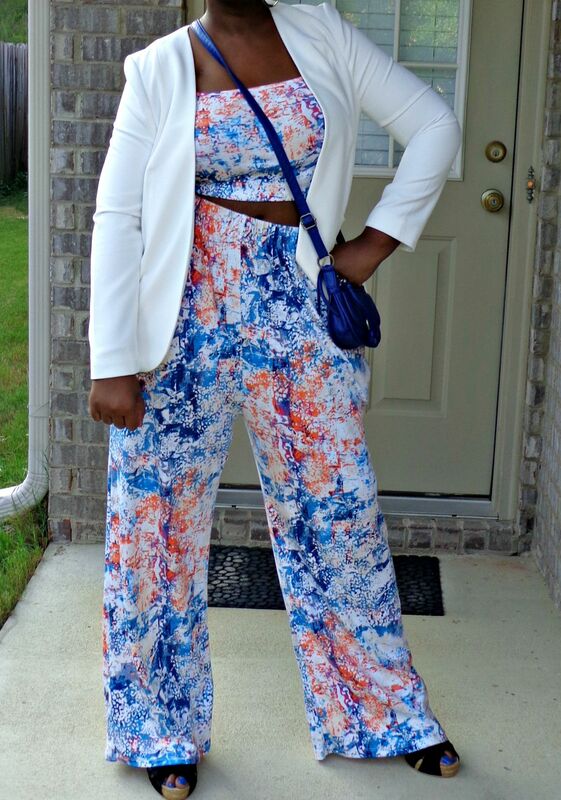 You rocked this outfit! Very classy and sassy! Love the colors! So summery and nice. I heard that Jill Scott Concert was really awesome. Very cute! It’s all nice and summery. I hear the Jill Scott concert was great. She can sang! It was great. Thanks! I love going to concerts and a fun outfit is always necessary. I love that you chose bright colors! This outfit is so cute! I love the 2-piece outfit, the white blazer and the crossbody bag. The wedges look comfortable as well. You better werk! Thanks a bunch. The wedges are super comfy. Thanks so much for stopping by and commenting. I really appreciate it! This is a cute outfit that appears functional as well. Looks like you are ready for a great time with Jill.